Love this can’t wait to read more. O! wow! Where is my copy?? This is really really good. I generally don’t read so much romance but I will read this……. I hope I get a free signed copy from you? (I’ll swap you one for a copy of mine?) Strong stuff and it sounds like it’s going to be a very passionate novel. The male character is very much my voice and thoughts about things. The beta readers have said they definitely hear my voice in it and they like it. And they like the unusual way it’s done, or more unique perhaps. Oh I agree with them. There’s nothing better that using your own voice and thoughts as they are unique to you. Thinking and writing like you are somebody else has its problems but I always think that there’s at least a tiny part of you in what you write when writing as if you were somebody else. Having never met you in person, I could tell just from what I have read on your blog, that it was your voice coming through. Now that is a compliment that just swept me off of mine. All the best Ron..cant wait to read the book! 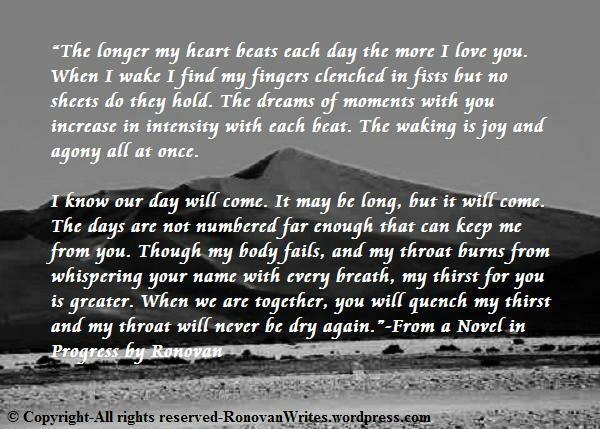 Lovely writing, Ronovan. I wish you every success with your novel writing journey. Cheers, Maria. Thank you very much. I know it was likely typical of romance, I’ve never read them. I just write how it feels to me.